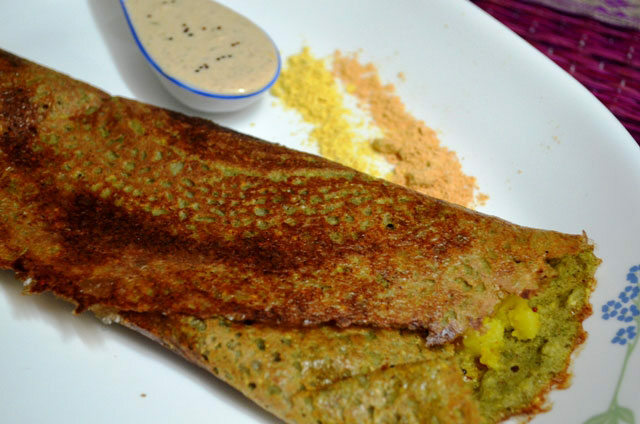 An authentic Andhra Style Dosa (Indian Savory Crepes) made with the Green gram, it’s spicy, healthy and delicious. Pesarattu is a famous crepe or dosa (as said in India), is uniquely served in Andhra Pradesh, India. 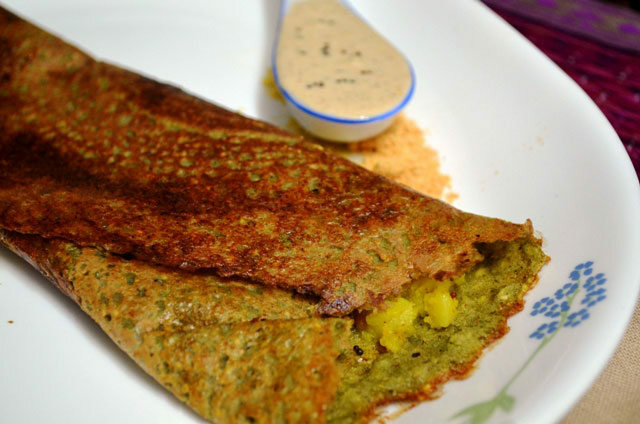 It is different in ingredients, taste and green colored in comparison with the normal dosas eaten in India.The dosa is made of Green gram and thus is very high in protein. It is an ideal healthy recipe to be served to kids for breakfast or as a snack. The best thing I love about dosas is you can experiment a lot with the fillings of your choice or just serve it plain and crispy. One more variant of Pesarattu served with an Upma filling is famously known as MLA Pesarattu- quiet an unusual name!! Well I usually eat my Pesarattu with mashed potato filling which is tempered the south Indian way. Try out my recipe and experiment it with the choice of your filling and let me know which one suited your palate the most. Soak Green gram and Rice in water for 12 hours. Grind the soaked mixture with adding all the above ingredients into a fine paste. Masala- Take 2tsp oil in a pan, add mustard seeds and let then crackle. Now add curry leaves, Urad Dal, Channa Dal and roast them until light brown. Now add chopped onions, green chillies and sauté for few minutes till the onions are transparent. Now add turmeric powder and mashed potato. Mix well and add chopped coriander leaves. Your masala mixture is ready. Chutney- Roast peanuts without oil, take them out and keep it aside. Now add some oil in skillet, add mustard seeds and let them crackle, now add Chana dal, Urad dal, curry leaves, dry red Chilly and roast it for 2-3 minutes. Grind peanuts, the tempering, tamarind pulp, ginger, salt and water in a grinder. Adjust the consistency by adding more water as per your requirement. Now for preparing dosas- Heat a flat non-stick pan or dosa pan. When the pan is hot pour some batter and spread it with the back of a big spoon by moving it in circular motion from centre to outward direction. After some time you will see that it starts getting brown. Now add some oil at the sides and in the centre also. Now reduce the flame to low and cover the pan so that the top portion gets cooked properly. After 2 minutes remove the cover and increase the flame to high again. 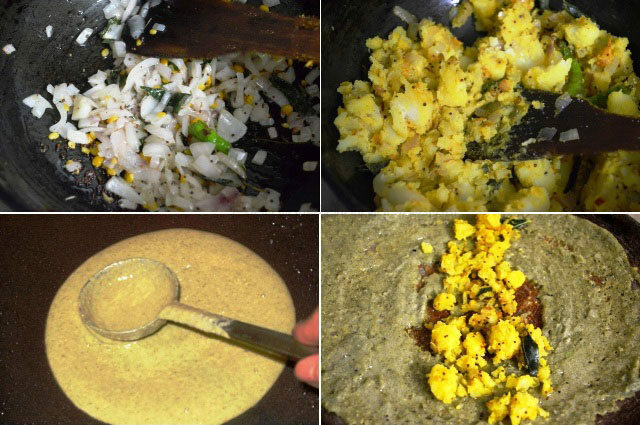 Now add the prepared masala at the center of the dosa. You will also see the sides will start leaving the pan. Now fold the dosa in desired shape. Serve hot with peanut chutney. For the next dosa. Sprinkle some water on the pan, it will crackle on hot pan rub it immediately with a clean cloth to remove the remains of previous dosa. 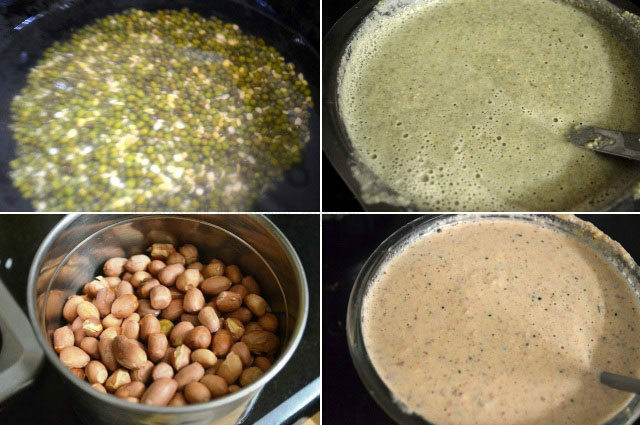 You can also use sprouted Moong dal for preparing dosa. You can replace potato filling with Paneer filling, cheese filling, mix vegetable filling, mix vegetable Upma filling or any other filling of your choice. You can also replace oil with butter or ghee and make it even yummier with few more calories to add on. This is one of my favorites……i miss weekend brunch at home with amazing pesarattu. It tastes fantastic with peanut chutney, but is very popularly savoured with ginger chutney as well. also, sprinkling jeera on one side of the pesarattu tastes brilliant.